Biotin is a water-soluble B vitamin typically found in liver, egg yolk, cereals, legumes and nuts. In the body, biotin is found in low concentrations in the brain, liver and muscle tissues. 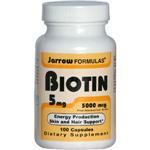 Biotin is essential for normal skin and hair growth, lipid metabolism and energy production (ATP). Alcohol consumption decreases biotin status in the body.